Cut loaf of dough crosswise in half to make 2 loaves. Place loaves seam sides down and 3 inches apart on cookie sheet. With sharp knife, cut 3 diagonal slashes, 1/2 inch deep, on top of each. Bake 23 to 25 minutes or until golden brown. Cool 2 minutes. Meanwhile, in small bowl, mix tuna and mayonnaise until well blended. Set oven control to broil. With serrated knife, cut loaves in half horizontally; place cut sides up on same cookie sheet. 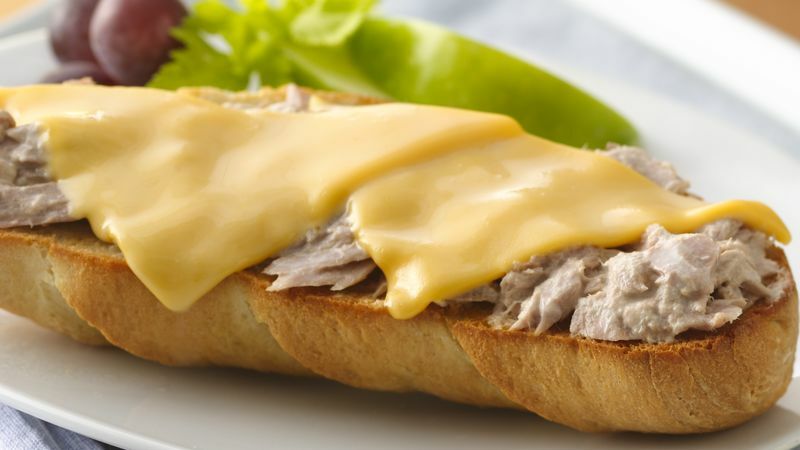 Spread 2 heaping tablespoons tuna mixture onto each half loaf. Top each with 2 cheese triangles. Broil 4 to 5 inches from heat 1 to 2 minutes or until cheese is melted. For a flavor twist, stir 1 tablespoon pickle relish into the tuna mixture.